i know, i know :) i fell in love with the color at maryland sheep + wool. so i decided to spin it as is, adding nothing. 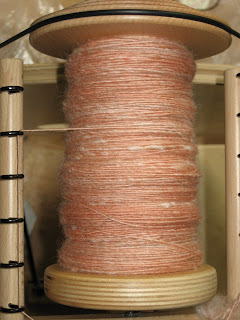 i occasionally like these forays into the world of tiny yarn, and then i usually have to spin something about as thick as my finger...so i think there's about 5 million yards on here so far, and the bobbin's not filled. guess i'll keep going!